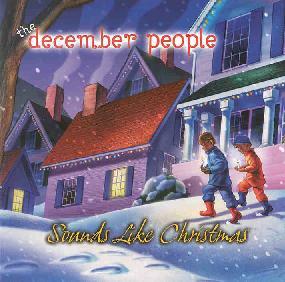 The December People - "Sounds Like Christmas"
Here you have it folks. All your favorite Christmas songs performed by Robert Berry and a cast of guest vocalists like Steve Walsh, John Wetton, Trent Gardner, and others, but intentionally styling the music with the thought as to how it would have sounded if played by various classic prog rock bands (and sorta prog bands). I was actually happy to read this because when I first listened to the CD I was getting a bit annoyed by the blatant cloning I was hearing from track to track. So we've got "Little Drummer Boy" as if performed by ELP, "The First Noel" as if performed by King Crimson, "What Child Is This" as if performed by Genesis... and so on, including Christmas clones of Yes, Sting, Pink Floyd, Led Zeppelin, Peter Gabriel, the Beatles, Queen, and Kansas. Kansas had more involvement in the project as Steve Walsh sings on a couple tracks and even wrote one song specifically for the album which he recorded with Kansas. But overall, if you think it's a jim dandy idea to hear "What Child Is This" played in the style of Lamb Lie Down On Broadway, "Silent Night" being a dead ringer for Us And Them, and "The First Noel" as a knock-off of In The Court Of The Crimson King and 21st Century Schizoid Man, then step right this way. One shining light in the set is a cover of John Lennon's "Happy X-mas/War Is Over" which is very well done and includes lots of variety. Like all Magna Carta releases the performances are top-notch and the production some of the best you'll hear in the prog world. But I'm afraid it all came across as being a bit corny to me. God I feel like such a scrooge saying that the day before Christmas!! But... you be the judge. For more information you can visit the Magna Carta web site at: http://www.magnacarta.net. Contact via snail mail c/o Magna Carta; PMB 1820; 280 E. 51st St; New York, NY 10022-6500.